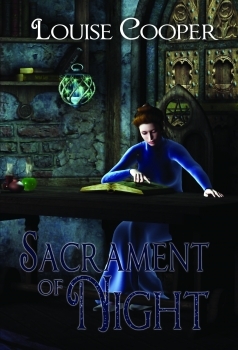 Review: I liked the setting for “Sacrament of Night”: a door, a key, and an impossible romance between two beings from mirror worlds, one of light and one of darkness. That it was written by Louise Cooper was an additional plus because I’d read very fine fantasy from her before. I was not disappointed in this new book. I found the storyline very well thought out, with plot and subplots complex and interesting enough to keep me curious and engaged. It was moderately paced with substantial amounts of detailed interaction between the main and support characters, those of the world of light, but I would also have liked a wider range of information about the creatures of the Twilight, who they were, how they came to be, and their world. There were times I found the changes in point of view within a single scene somewhat confusing but I enjoyed “Sacrament of the Night” very much overall. I found the world building vivid, the characters, for the most part, believable, and the tempo, climax and resolution everything that I expect in outstanding fantasy literature. It would be a book I’d add to my shelf and definitely reread. Book Description: They’ve been visiting the human world for centuries, the strange, frail, totally colorless denizens of the Twilight Dimension. Lured by the color, the brightness, the sheer vitality of mankind’s world, they mean no harm–but few of them ever return home. Posted in Reviews. Tagged books, fantasy books, louise cooper, reviews.